I often receive emails from visitors who want to go to Raja Ampat but do not want to visit places that are considered as more touristic. They want to see the islands that are outside of the main-stream marine tourism routes. To cater for these requests, I offer a new route located in the north east of the archipelago. Its name is the jungle or Warebar river and a group of karst islets called Dolphins Lagoon. 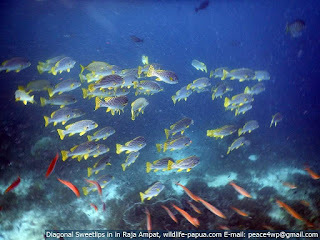 Raja Ampat is a famous destination for marine lovers. Most visitors go to Mansuar, Kri, Gam, Arborek, Kabui bay and Pianemo. As a tourist guide, I want to promote the northeast region of Raja Ampat that is also beautiful. Visitors can go trekking through Warebar river to watch birds and other wild animals, or swim at the white sandy beach of Yenandau, and enjoy snorkeling over the coral reef of Mamiaef island and the sand banks of the sea. I don't know why local people called it Dolphins' Lagoon. Perhaps, it was a feeding ground for Dolphins. But it really has got beautiful landscape (or seascape). In addition to swimming, and snorkeling, visitors can see beautiful scenery of Dolphins' blue lagoon and swim over its coral reef to see various colorful reef and a lot tropical fish that live in the tropical waters of Raja Ampat. 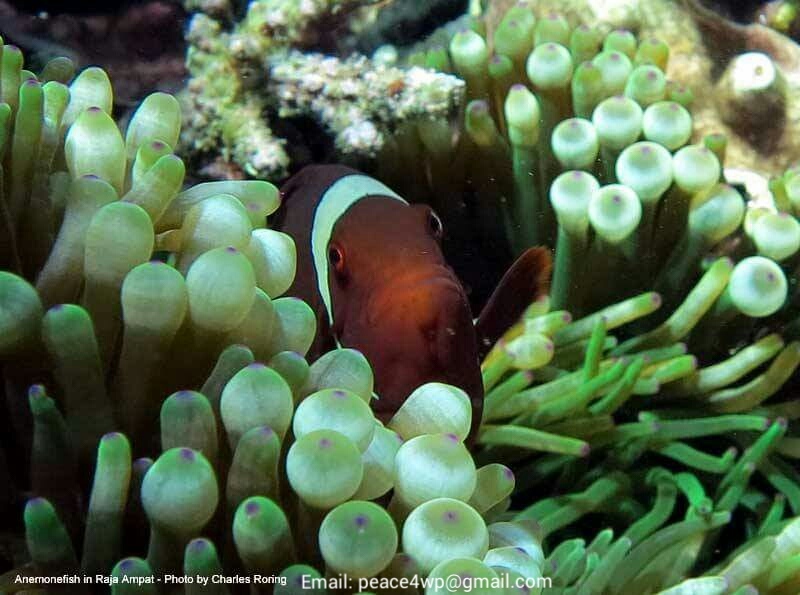 Make sure that you bring a good camera for take pictures of underwater and above-water marine environment. Colorful parrotfish, surgeonfish, butterflyfish, and groupers thrive in the area. However, since we go there to watch marine animals in natural place, I cannot give 100 % guarantee that you will see dolphins. Buying food and other supplies in traditional market and supermarket. Leaving Sorong for North East region of Raja Ampat, we will pass by Urbinasopen village and its Imbikwan island and sea sandbanks. We will continue our trip to the north east where we will enter a big bay and land on the beach. We will take a rest in a villager's house after the long boat trip. After that we will explore the village (known as Yenbekaki) and swim at its beach. In the afternoon, we can go hiking in the hills behind the village. At night, we can do night walk in search of turtles that land on the beach to lay eggs. 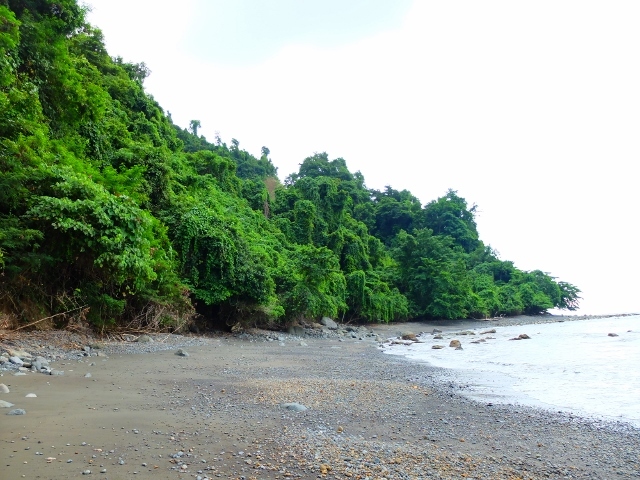 This time we will explore the tropical rainforest of Waigeo island by going through Warebar river to see its wildlife. Cuscus possum, Sulphur Crested Cockatoo, Papuan hornbills and soa-soa lizard are some of the animals that live in the jungle. We could spend one night in tents in the jungle. We will leave the river to Yenandau beach. We will enjoy swimming and snorkeling over its coral reef. 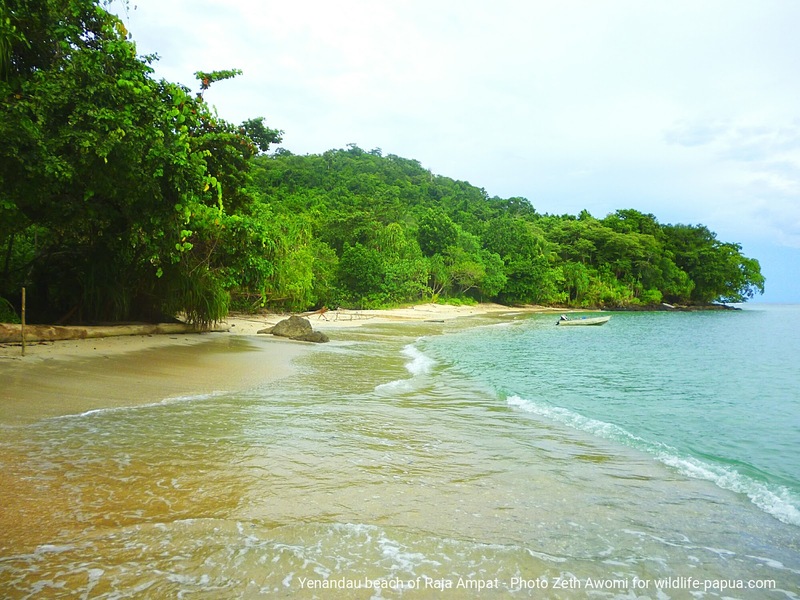 After that, we will continue our trip to Mamiaef island where we will swim over its coral reef. We will explore the coral reef in the sand bank areas, and walk along the beach of the mainland. Overnight stay in Mamiaef island. We will continue our trip to Yensner to see its blue lagoon. Crystal clear water of the lagoon is home to a lot of species of reef fish. We could walk up the slope of one of the islands in the lagoon to take beautiful pictures of the scenery. We will spend one night in Yensner. Participants: This tour is suitable for those who like nature (hiking in the jungle and watching wild animals as well as swimming and snorkeling over coral reef to see marine animals). I suggest that the number of participants should be at least 4 people to share the cost. If you are interested, please, contact me (Charles Roring) by e-mail to: peace4wp@gmail.com for more customized itinerary and cost calculation. 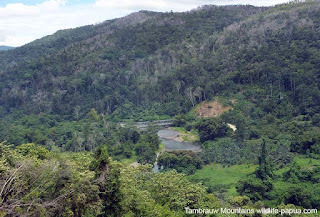 Arfak mountains of Manokwari have been an important birdwatching destination since early 1990s. Most birdwatchers go there to find Lesser Birds of Paradise (Paradisaea minor), Vogelkop Bowerbird (Amblyornis inornatus), Magnificent Birds of Paradise (Cicinnurus magnificus), Cinnamon Ground Dove (Gallicolumba rufigula) and a lot of other birds that live in the jungle. There are several places in the mountains that are frequently visited by tourists. 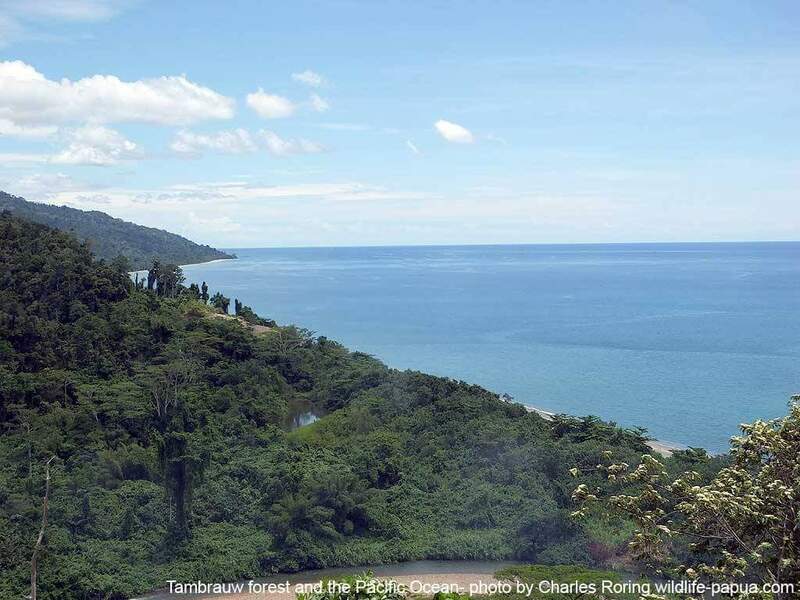 In this article, my focus of description is Mawowi forest. It is located in the eastern part of Arfak range. Visitors who go there will stay in the jungle. There is a campsite for tourists located deep in the forest. 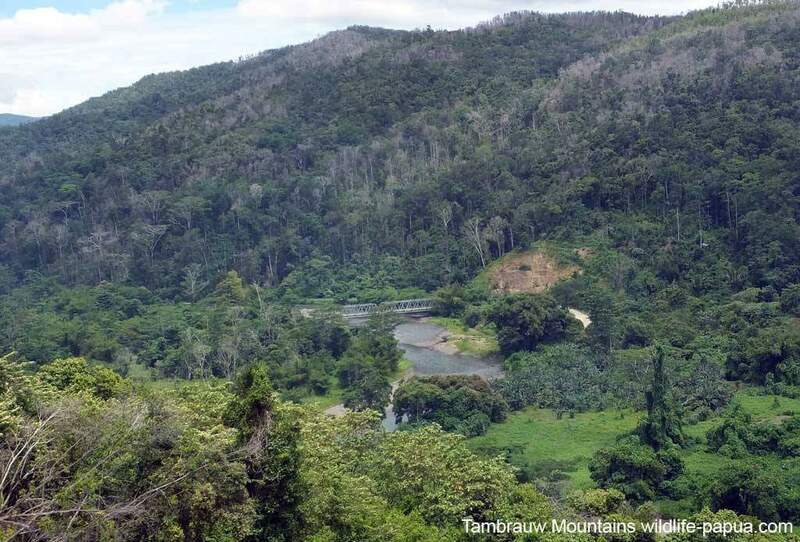 It can be used as a base to watch birds, insects and other wild animals that make Mawowi forest as their natural habitat. Mawowi forest is under the traditional territory of Warmarway village. Visitors can go there by car or by motorcycle. It takes around 1 hour to reach the coastal village by motorized vehicle. Local villagers can work as porters, cooks to help birdwatchers explore the jungle to see its wild animals, colorful birds and unique plants. 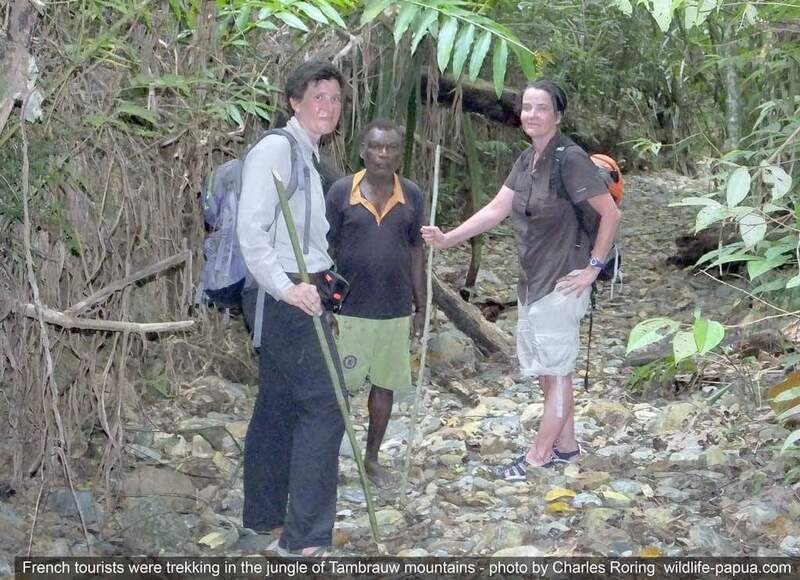 On the average, visitors stays between 3 to 4 days in the jungle to explore the bio-diversity of Arfak mountains. As a tour guide, I can organize birdwatching and camping tour in Mawowi Forest of Arfak range for anybody who is interested in staying and birding in the mountains. I organized a camping and birding tour from 15 to 17 August of 2016 for two tourists in the forest of Tambrauw mountains. They were Sophie and Sonia - two ladies from France. We went there by a 4WD car that brought us on a 4-hour ride from Sorong city to Sunai river and then back to Syuan river. On the second day of our trip, we enjoyed snorkeling to see coral reef and tropical fish that made Tambrauw waters as their natural habitat. Some of the fish that we saw were parrotfish, damselfish, moorish idol, pipe fish, striped surgeonfish, fine-lined surgeon fish, lined bristletooth, black-tailed dascyllus, anemonefish, table coral, sea star and a lot of other marine creatures which I still could not identify by myself. At night, we saw a huge colony of firefly that was gathering in a tree not far from our tents. During the trip we were able to watch Lesser Birds of Paradise (Paradisaea minor), Palm Cockatoo (Probosciger aterrimus), Sulphur Crested Cockatoo (Cacatua galerita), Eclectus Parrot (Eclectus rotatus), eagles at a mountain ridge located in the east of Syuan river and at a forest clearing near Sunai river. We also saw crayfish in the river, wild flowers and various colorful butterflies. It was a wonderful experience for the French ladies. We returned to Sorong city in the afternoon where we watched street carnival the next day. School students were wearing traditional clothing, dancing and playing drums. The carnival created long traffic jam in the streets. After a short tour in traditional market where we saw various kinds of vegetables, fruits, and other consumer goods, these French ladies returned to Swissbelhotel. As a tour guide, I offer rainforest camping and birding tours in the jungle of Arfak range, Tambrauw mountains, Klasow valley of Sorong regency and Manokwari. I have just completed a boat trip along the north coast of West Papua. I guided five visitors from the Netherlands. 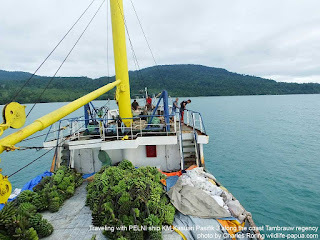 We left Manokwari city by PELNI ship KM Kasuari Pasifik 3 for Sausapor town (the temporary capital of Tambrauw regency). The ship stopped in the waters of such villages as Saukorem, Imbuan, Waibem, Wau, Warmandi, Saubeba, Kwor, Opmare, Werur and finally arrived in Sausapor. That's our destination. But the ship continued its voyage to Sorong. We stayed for 2 days in Sausapor and explored the natural beauty of the little town. We enjoyed snorkeling over its beautiful coral reef and spent one night at the beach in search of turtles. Unfortunately, no turtles landed that night. However, we saw green frog, a large beach crab and snake. At the end of our adventure in Sausapor, we continued our trip to Sorong city by KM Sunlia. KM stands for Kapal Motor meaning Motor Vessel. KM Kasuari Pasifik 3 carries cargo and passengers. Its price is 50,000 rupiahs (approximately 4 Euros) per person. Because the ticket price is so cheap, tourists can use their extra money to buy fruits, food, and souvenirs from local Papuan people. This is important for the economic livelihood of the villagers who live along the coastal area of Tambrauw regency. It stops for 2 to 3 hours in the waters of every village that I mentioned above. During the stop period, visitors can go to the village to enjoy fishing, swimming, snorkeling or have walking tour around every village. 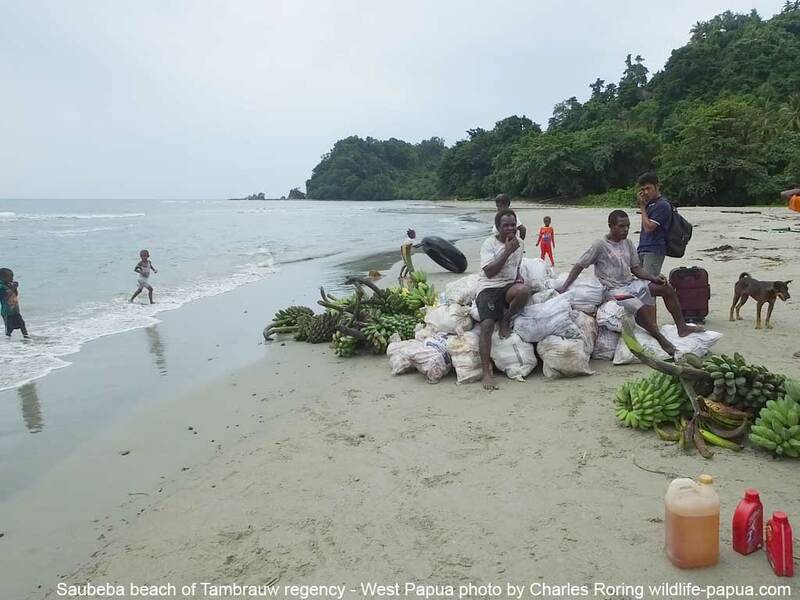 Visitors will also meet Papuan people in their daily life, before returning to the ship for their next adventure. 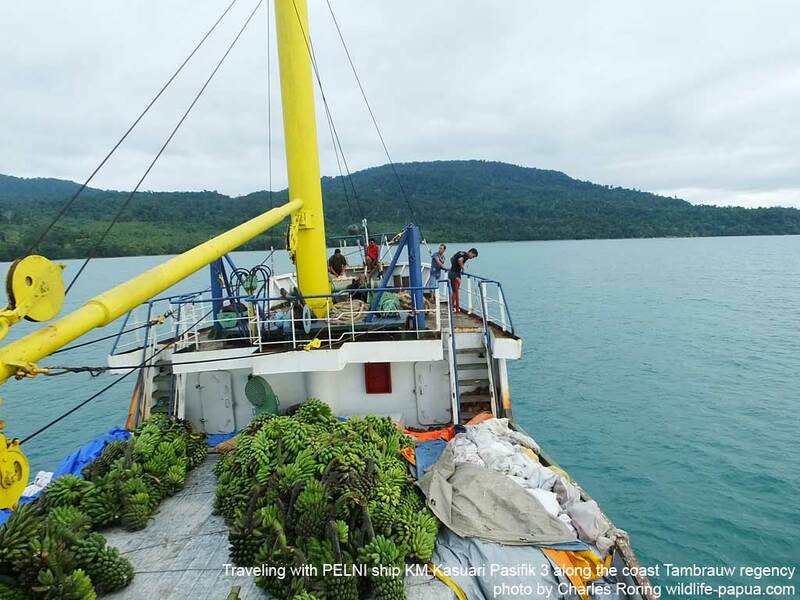 KM Kasuari Pasifik 3 sails between Manokwari and Sorong four times a month. It usually carries 100 passengers. Every passenger gets his or her own bed. During school holiday seasons and Christmas time, it can carry up to 200 people or even more. Visitors, upon an advanced arrangement by a tourist guide, can rent rooms in the ship that are used by ship crews. The price is 700,000 rupiahs per room for the whole trip. It can accommodate between 2 to 4 people depending on the number of bags that they carry. The ship plays vital role in supporting the economy of the villagers. It carries agricultural produce such as banana, coconut, and cocoa beans. Villagers also carry deer, goat, pigs, dogs, and other animals which they want to sell in Sorong or Manokwari. I provide a combined snorkeling tour in Raja Ampat islands and trekking tour in Tambrauw Mountains of West Papua province of Indonesia for visitors who are interested in seeing the rich biodiversity of West Papua's coral reef and tropical rainforest. Raja Ampat has been famous as the number 1 destination for marine tourism. Every year, tens of thousands of scuba divers and snorkelers go there to see tropical fish that thrive in pristine coral reef of the archipelago. Until mid-2011, marine biologists recorded 1,427 reef fish and 553 hard corals and 42 mantis shrimp. These numbers have brought Raja Ampat as the richest in the world for marine biodiversity. Some of the marine animals that visitors may see include Wobeggong Shark, Raja Epaulette Shark, Manta, Giant Trevally, Black Tip Reef Shark, Bluefin Trevally, Grouper, Red Slender Anthias, Damselfish, Butterflyfish, Moorish Idol, Anemonefish, Spadefish, Scads, and a lot more. The snorkeling and sightseeing tour usually lasts for 5 days/ nights. In addition to pristine coral reef, West Papua is also a perfect destination for anybody who is interested in exploring its tropical rainforest. Walking in the jungle, visitors will be able to see exotic plants, colorful butterflies, and birds. 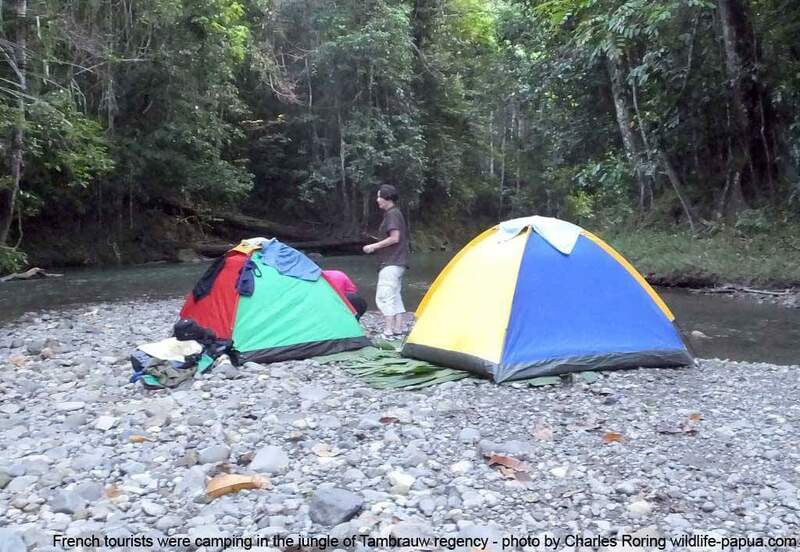 As a tourist guide, I offer a 4-day/ 3-night trekking and camping trip in the jungle of Tambrauw Mountains. 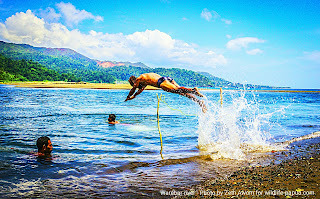 During the trip, visitors will be able to explore the coral reef in Kri island, Mansuar island, Kabui bay, Gam island, Arborek, and Pianemo as well as trekking and camping in the forest along the bank of Syuan river in Tambrauw regency of West Papua. For outdoor camping in the jungle, a good sleeping bag and flashlight will be useful. Raja Ampat has been famous around the world as the best destination for marine tourism. It is located in West Papua province of the Republic of Indonesia. As a tourist guide, I organized a tour for 4 Czech tourists last week. We had a 5-day/ 4 -night sightseeing and snorkeling tour in the archipelago. During the tour, we went snorkeling in Kri, Mansuar, Kabui bay, Pianemo (Fam islands), and Gam island. It was a great experience because we could see a lot of fish including black tip reef shark, anemonefish, boxfish, baracuda, scads, giant trevally, grouper, butterflyfish, parrotfish and a lot more. We also saw several hawksbill turtles in the waters. Here are some pictures of coral reef and tropical fish that I saw when I went snorkeling in Raja Ampat. There are a lot of coral reef areas that are suitable for snorkelers. Visitors who want to go there need a good motorized boat. I will meet you at the airport and arrange your trip to Raja Ampat. In addition to snorkeling tour, I also provide rainforest tour in the mainland of West Papua particularly in Tambrauw regency. During the tour, participants will be able to walk through the jungle and the river; and stay in tents that are built at the bank of Syuan river or Syugrar river. The tropical rainforest of Tambrauw is the natural habitat of sulphur crested cockatoo, blyth's hornbill, and various species of swallowtail butterfly. If you are interested in taking a tour package to Raja Ampat, please, contact me (Charles Roring) by email to: peace4wp@gmail.com. Sorong city is the main gateway for scuba divers who want to go to Raja Ampat. Actually, its lowland forest in Klasow valley is the natural habitat of hundreds of species of birds. I and some foreign visitors spent 1 full week hiking and birding in Klasow valley early this year from 31 December 2015 until 5 January 2015. I use Birds of New Guinea: Second edition (Princeton Field Guides) by Thane K. Pratt and Bruce M Beehler as my main reference in identifying birds. It has got rich information about the avifauna of New Guinea that spreads across Papua New Gunea (an independent state) and West Papua (currently the territory of Indonesia) and their satellite islands. This was for the first time I brought a spotting scope Eyeskey 20-60x60. It greatly enhanced my birding experience. Unfortunately, I could not take pictures of all of the birds that I mentioned above. My camera was a Fujifilm HS 50EXR. Although it was a good camera, its optical zoom was only 42x. It could not shoot birds in distant trees. But with careful approach, I could take some pictures that seemed to be very difficult to shoot including the Azure Kingfisher. I and Jan (one of the tourists) were sitting on the bank of a small river when the kingfisher landed on a vine that was hanging over the water. Perhaps, it was looking for food. In the evening of 4 January 2016, I and Jan were having an easy walk around the village in the clearing area near the entrance path. We saw a lot of birds including a mother Spangled Drongo that was feeding her baby. The nest was constructed on the lowest branch of the tree. The mother bird was not afraid of us who were trying to "shoot" her with camera. It was a really nice trip for me and our visitors. In addition to birds, we also saw wallaby, bandicoot, frogs, snakes, a lot of insects particularly colorful butterflies that were flying over flower plants around our jungle 'guesthouse' to find nectar. 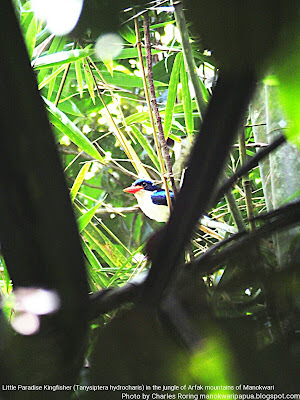 The tropical rainforest is really a recommended place for watching lowland birds of New Guinea. If you plan to have a birding trip in West Papua, please, contact me (Charles Roring) by e-mail to: peace4wp@gmail.com. I will be happy to be your guide.